NOTE: This content is old - Published: Tuesday, Aug 9th, 2016. Twelve days ago it was announced the student flats by the Racecourse ground were up for sale, that same day we asked Wrexham Council four relevant questions. Looking back to 2009/10 when the plans were made public and approved by Wrexham Council Planning Committee the link between the development and the fortunes and future of the Football Club were clear. Within the report considered by Councillors the overall development would have seen three phases, with an undertaking to ensure all promises were kept. A week later the Addendum Report notes scathing concerns that any agreements could mean no guarantees for a new stand within five years, and “could not guarantee anything”. It also notes any agreements would ‘not be enforceable against future owners’. The addendum report states: “The Council’s solicitor has been closely involved in its drafting and is satisfied with its legality.” The note adds that the Planning Authority would be ‘ill advised’ to seek anything more onerous, however if so wished a redraft could take place. 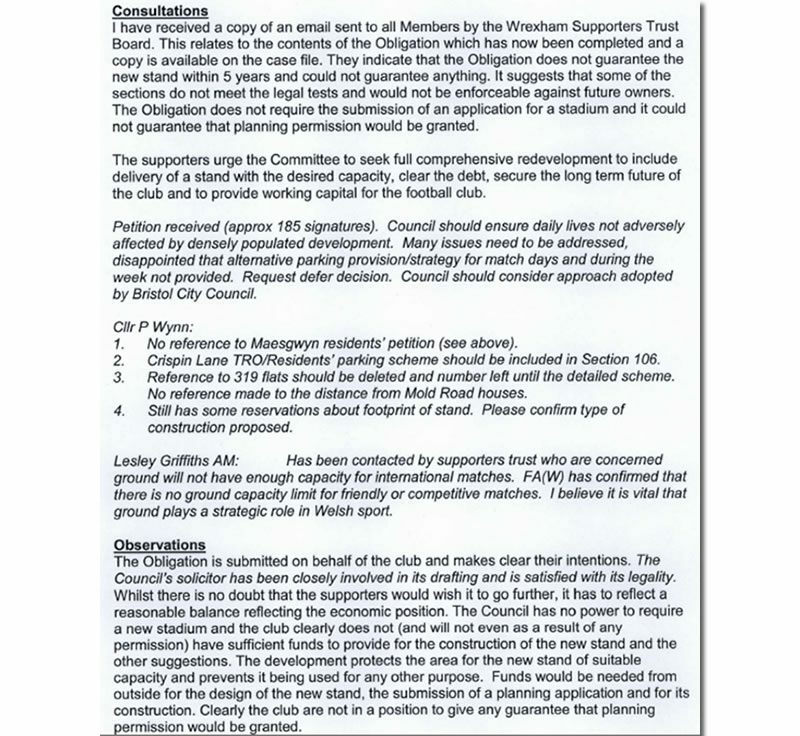 Due to the above indicating that the student development was directly linked to the fortunes of the Football Club, and faith placed in the Local Authority’s Planning system by fans and the wider community to secure that vision, we asked Wrexham Council for comment from a relevant person on the following points. 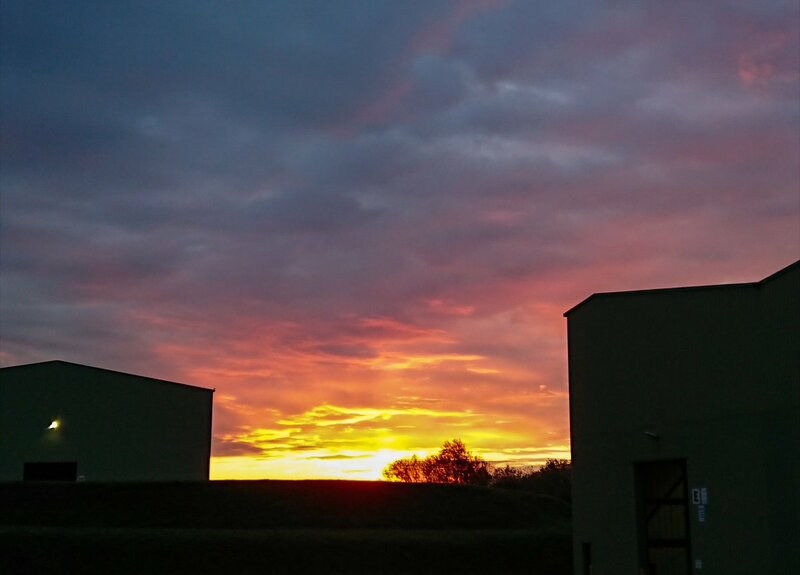 Question 1: Does the collapse of the Wrexham Village project reflect well on the WCBC planning process including the value of assurances developers give Committee? 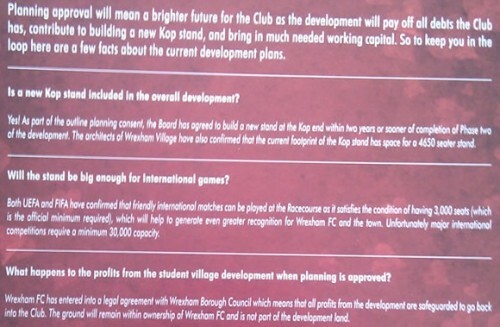 Question 2: Is there any agreement with the developers and WCBC in place that will result in funds returning to the current Wrexham Football Club, and / or obligation to provide a new stand? 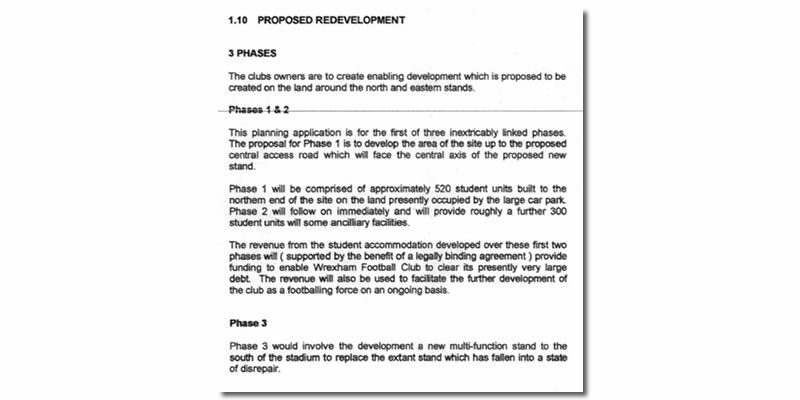 Question 3: Does WCBC believe the planning and development secured the Club’s continued operation and the construction of a replacement stand as intended? Question 4: In 2011 the Daily Post reported a probe was underway http://www.dailypost.co.uk/sport/football/football-news/council-probes-wrexham-fc-racecourse-2732495. Is this report accurate, and if so, what was the report of the probe and who was it provided to? “The offer of any profit to be given towards the construction of a new spectator stand was offered by the applicant in response to concerns raised about the future of the Racecourse ground. It is interesting to note that in the planning details there are various concerns voiced from Offa and Rhosddu Community Councils, Wrexham Supporters Trust, Cllr Alun Jenkins (who offered a very detailed objection) all of whom were skeptical of promises not being kept. Local MP Ian Lucas, then AM Karen Sinclair objected over concerns that a future footprint for a Kop redevelopment would not be sufficient with AM Mark Isherwood echoing Wrexham Supporter Trust concerns. The student flats are for sale for £12,920,000. Wrexham Football Club will see £0 from that sale.